With recent advances, researchers can synthesize silk with mechanical properties similar to those of an actual spider's silk. But applying this material to promising medical therapies for illnesses such as cancer requires that humans develop a capability that only arachnids or silkworms possess – the ability to control the formation of silk. A technique reported today in Advanced Materials offers a promising alternative to experimental silk-forming methods that rely on harsh chemicals, says Associate Professor My Hedhammar, a researcher at KTH Royal Institute of Technology in Stockholm. With high elasticity and strength comparable to Kevlar, spider silk has drawn attention for its potential use in medicine. Researchers are hopeful that it can serve as scaffolding for tissue repair, or be used for drug delivery, sensing of biomarkers and antimicrobial coatings. But finding a satisfactory method of producing silk-mimicking proteins has proven difficult. "Attempts have been made to imitate the spinning process using microfluidic systems, wet-spinning and electrospinning," Hedhammar says. "Many of these processes are quite complex to design and require harsh chemicals such as methanol to render the threads water insoluble after formation, which would kill the bioactivity that's needed for these medical uses." Instead, the researchers drew on recently developed biochemistry techniques that use micro-patterned surfaces in order to concentrate proteins and form organic nanowires, coatings or sheets. The team used a surface comprised of micro-sized silicon pillars that were rendered water repellent with an anti-wetting agent. How synthetic silk structures are made without chemicals. The researchers designed two types of silk proteins – one with an affinity to antibodies, and another with cell binding properties. By placing droplets of the soluble silk proteins on top of the pillars, the team was able to achieve three distinct formations of synthetic silk: nanowires (which could be used in cancer therapy), local coatings (potentially useful in biomarker detection) and silk sheets (which could be used as cell growth scaffolds). 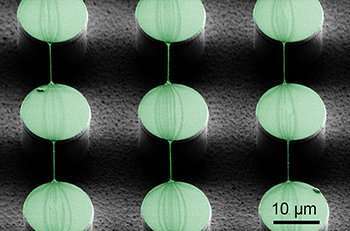 To create nanowires, the researchers placed a droplet on the surface, and then dragged it laterally, leaving strands of the material spanning the pillars. Similarly, to create a sheet, the scientists left a droplet to evaporate on top of the surface. The stability of the sheets was tested by submerging them in water, as well as in a cell culture medium, for a number of days. "The sheets remained intact, without visual signs of being dissolved, confirming that the proteins had transformed into a stable silk form," says co-author Professor Wouter van der Wijngaart of KTH. The paper, "Structuring of Functional Spider Silk Wires, Coatings, and Sheets by Self-Assembly on Superhydrophobic Pillar Surfaces," was co-authored by KTH researchers Linnea Gustafsson and Ronnie Jansson, in addition to Hedhammar and van der Wijngaart.